Cornelius Barritt was born in 1883, and was a bank clerk, living in Pinner, Middlesex. 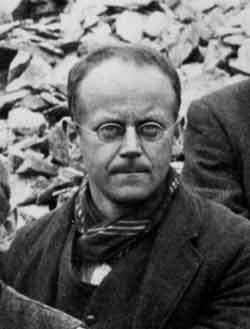 A Quaker, Corney, as he was known to his friends, opposed British participation in the First World War, and, faced with conscription in 1916, he applied to the Hendon Military Service Tribunal for exemption. At a hearing on 6 March he was allowed only exemption from combatant service, meaning a liability to be called-up to the Non-Combatant Corps (NCC), guaranteed not to use or even handle weapons, but nevertheless part of the Army. Appeal to the Middlesex County Tribunal served him no better, and he ignored a notice to report for training. He was arrested by a civilian police constable, brought before Wealdstone Magistrates Court on 16 April, fined £2 and handed over to the military. Taken to Mill Hill barracks, north London, for enlistment in the 1st Eastern Company, NCC, he refused to obey orders, such as to put on a uniform, and was held in the guardroom pending disciplinary process, taken to Landguard Camp, Felixstowe, Essex, and then Harwich Circular Redoubt, where at a disciplinary hearing the Commanding Officer sentenced him to 28 days Field Punishment No 1, involving being strapped to a fixed object for a number of hours each day. On 8 May he was transported, with 16 other resisting COs, by ship from Felixstowe to Boulogne, France, to be held there, shackled in irons, in Field Punishment Barracks, on a diet of bread and water. Continuing military disobedience led to Court-martial on 10 June, resulting in sentence to death by firing squad, confirmed by General Sir Douglas Haig, but immediately commuted to ten years penal servitude. Corney was returned to Britain and admitted to Winchester Prison on 30 June, transferred briefly to Wormwood Scrubs Prison for interview by the Central Tribunal on 7 August, where he was offered and accepted the Home Office Scheme; this entailed discharge from Winchester Prison on 31 August and transfer to Dyce Work Centre, Aberdeen, working in a granite quarry, and famously photographed with other ‘Frenchmen’ (COs sentenced to death in France). On the closure of Dyce Work Camp in October (after the scandalous death of CO Walter Roberts), Corney transferred to Wakefield Work Centre, but by December 1916 he renounced his acceptance of the Scheme, entailing return to imprisonment, this time at Armley Prison, Leeds, until January 1917, when he was transferred to Maidstone Prison, Kent. Notwithstanding his ten-year sentence, he was finally released on 8 April 1919, under the blanket provision at that time for releasing all COs who had served at least two years in prison. Shortly before the Second World War in in 1939 Corney sheltered refugees from Austria.